Disney World has had a surge in attendance in the last couple of years, in huge part due to people wanting to take their Frozen-obsessed kids (or themselves) to see anything related to the movie. This new ride at Epcot is located in the Norway pavilion of the World Showcase and features some of the best animatronics at Disney World. It's a gentle boat ride with a slight drop and backward movement. Although the World Showcase as a whole doesn't open until 11 a.m., the Norway pavilion (including this attraction) opens at 9 a.m.
Due to its popularity and frequency of closures, it's ideal to have a FastPass+ for this to reduce wait times (if it breaks down, you can return at any time to use your FastPass+). Without a FastPass+, you should plan to arrive at Epcot at least 45 minutes before the official park opening and head straight there when the park opens. 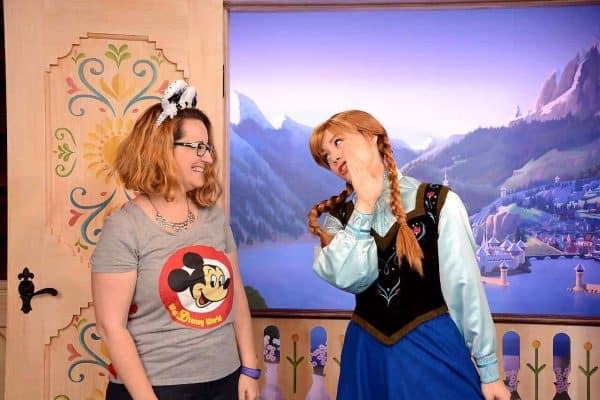 The only place where you can actually meet Anna and Elsa at Disney World and take a pic with them is at Royal Sommerhus, also located in the Norway pavilion at Epcot. This meet-and-greet does not have a FastPass+ option, but that shouldn't be a big problem due to relatively low wait times. At this meet-and-greet, you will enter the sisters' summer home and go into a room where you will meet them each separately. You cannot meet them both at the same time. 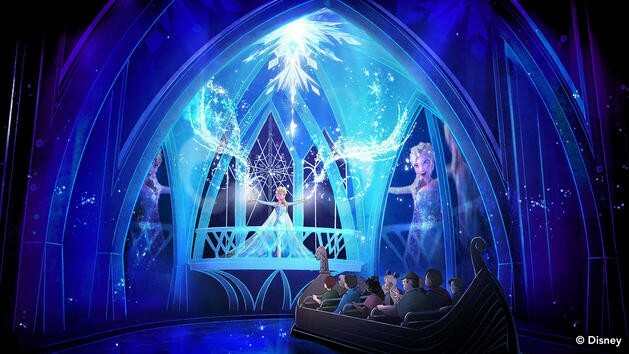 Since the Frozen Ever After ride is nearby, it will usually make sense to do them together. If you plan to ride Frozen Ever After at park opening, head to this meet-and-greet right afterward. Wait times will be low and it will be a nice continuation of the ride since the ride ends at the sisters' summer house. There are a couple of spots you can see Anna and Elsa at Magic Kingdom. Festival of Fantasy is so much fun to watch because the floats are so huge and colorful and it's just pure FUN. The train station at the front of Magic Kingdom is a recommended place to view the parade. You used to be able to watch from the top of the station under the covered portion, but now that area is reserved for VIP guests (every time we find a good idea, Disney finds a way to charge for it!). You can still watch from the uncovered portion on the top level of the train station if you'd like, or watch from the bottom level of the train station which is still covered and will get you out of the sun (a VIP tour guide said she much prefers the bottom level vs. the top level). After the parade, you can easily exit the park from here or hop on the train to travel to another part of the park, avoiding the crowds that have gathered on Main Street. Stage shows are a great way to catch a glimpse of a bunch of characters, including (Anna, Elsa, and Olaf), however, they can also be a challenge since crowds can make it difficult to see. Mickey's Royal Friendship Faire takes place several times a day in front of Cinderella Castle and for the best view you'll want to get there early and aim to get as close as possible or, if crowds are too heavy, you can try for a spot further back where you can still hear everything but you may not be able to see very clearly. 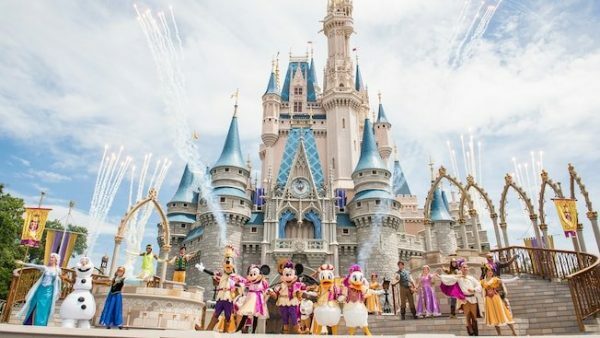 If you are a person that enjoys Disney shows then you might want to add this to your list of must dos, however, the downside to the daytime castle shows is that there is little to no shade and standing on the pavement during the summer months can be brutal. So, if you plan on seeing this show plan accordingly for that. 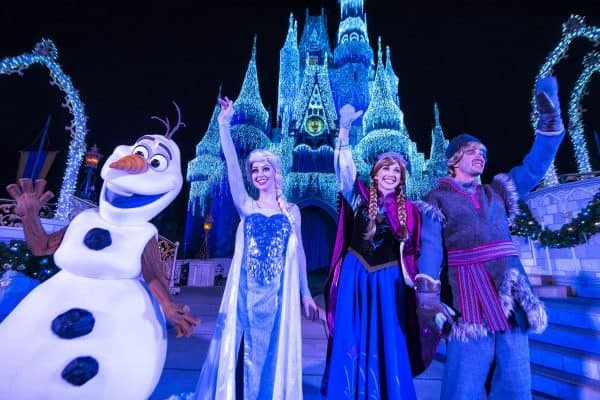 There are some additional ways to see Anna and Elsa during the holidays at Magic Kingdom. One requires a ticket to Mickey's Very Merry Christmas Party and one does not. This stage show takes places twice each evening in front of the castle (on nights with a Christmas party, one takes place before the party and again during the party) and includes a bit of dialogue between the Frozen characters, including Olaf. The finale of this stage show is the lighting of the castle which is beautiful. Find a spot in The Hub area about 30 minutes beforehand to make sure you get a spot to see the show. During the Christmas party, characters from Frozen can be seen in Mickey's Once Upon a Christmastime Parade which is shown twice during the party. The second parade will always be more lightly attended. Find a spot near Casey's Corner to view it so you can get the full effect of the snow falling on Main Street with a view of the castle and the parade. 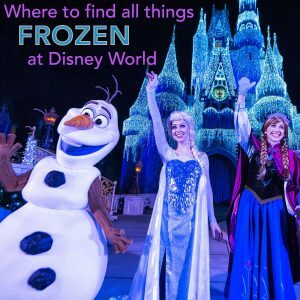 Although Hollywood Studios has become a bit of a construction site due to all of the changes being made there, there are some Frozen attractions you might want to check out. This 25 minute sing-along takes place in the Hyperion Theater (former home of the American Idol Experience). The show is basically clips from the movie with historians as the hosts. Anna, Elsa, and Kristoff appear on stage for a portion of it. This show is a lot of fun for people who are fans of the movie, and since the historians are hilarious, even non-Frozen fans can be kept entertained. FastPass+ is a good idea to guarantee entry because most shows get full. A FastPass+ allows you to enter before the standby line and sit closer, if you'd like (about 5-10 rows back from the stage in the center is a good spot to watch). You can now meet Olaf at Hollywood Studios in the Celebrity Spotlight area, located near Star Tours. There's a rarely much of a wait to see him, but stop by in the morning or at the end of the night for the lowest wait times. Check out this overview of new Hollywood Studios character meets for even more info. 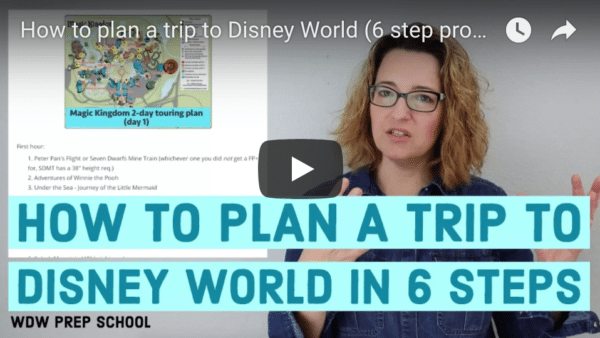 So, is Frozen a big part of why you're planning your trip? 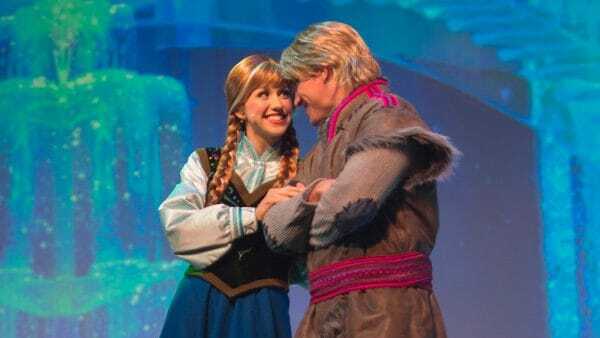 Do you still have questions about finding Anna and Elsa at Disney World? Feel free to leave your thoughts in the comments. Going to Epcot in 3 weeks. So for the meet and greet there are no FP available or needed and the wait lines are not as long as they were at MK last year, is that what I’m getting out of this? I know Epcot generally isn’t as busy as MK but just curious as to if that is true because my girls would love to meet them. There isn’t a FP+ available to meet them at Epcot, and the line rarely exceeds 20 minutes. It’s one of my favorite meet-and-greets because they built them their own home there. Enjoy your trip! Just got back from WDW on the 24th. The best way to see Anna ^ Elsa is to have a before the park opens reservation at Akershus. We finished dining at 9:05am from a 8:15 reservation. We got finished with 6 princesses by 9:30. We also walked right onto the Frozen Ever after ride with only a 10 minute wait. No Fast pass needed. My boyfriend and I are visiting WDW in September 2016. The schedule on the WDW website only has Olaf available mostly for Mondays and Wednesdays for almost the whole month, and we’re only there Thursday night through Sunday. Does anyone know if this is a tech glitch, or if we’re really not able to meet Olaf while we’re there? Thanks!! My family and I are going to WDW in September 2016. I know the Elsa and Anna meet and greet has moved from Magic Kingdom to Epcot but will they be in Epcot in September? They have permanently moved to Epcot, with a special house built just for them. We just got back last week. We went during the fireworks one night and waited maybe 15 minutes. If you’ve seen the fireworks before and weren’t able to get a fast pass, this is an easy way to market off the list. Hi there. I am wondering if you think the current meet and greet will close when the new one opens at Epcot. I have fastpasses at MK for late May…. do you think we will be OK on that? We just got home today from a week long trip. The ONLY “must do” fast pass I couldn’t get was Anna and Elsa. We had MK scheduled for Sunday and they opened at 8. I drug the whole family out of bed at 5:45, to have time to get breakfast and make it to MK by 7:30. They opened the park at 7:45 (which was the theme of our trip. Any day we made rope drop, they opened early) and we booked for Fairytale Hall. We were able to see Anna, Elsa, Cinderella, rapunizal , and Ariel (not in FH but nearby) within the first 20 minutes of being in the park. While being up that early wasn’t ideal (since we were park hopping to HS for EMH that night, it put us at almost 18 hours on our first day), it was the most productive day of our whole trip! We were able to meet Anna and Elsa without using a fastpass. The secret is to go during the 9 o’clock electric parade. All the families with young children are at the parade. We had a 10 minute wait, shorter then Cinderella! How long can I expect to be in line IF I’m able to snag a fast pass with Elsa and Anna? 5-10 minutes or so. That line moves quickly. very helpful question and answer! Thanks! We actually just left MK. We were able to meet Elsa and Anna without a FastPass and with only a 15 minute wait. How?! We had a breakfast reservation at Be Our Guest at 8:00. The park didn’t open until 9. We preordered our food the night before and were done eating by 8:30. My husband went over and snagged us a spot. We were 3rd in line! My girls were so EXCITED!! Anna and Elsa were so great! So, this might be an option if you can snag breakfast in the park before it opens! Would this strategy work with our Chef Mickey breakfast at 715? Would it be feasible to get in line for Anna & Elsa after that? We couldn’t get Fastpasses for them and, like practically every over 9yo there, my daughter realllllly wants to meet them. We have breakfast reservations at Akershus one day and there are people that have met them there, aside from what this post says. Anyone else met Anna and Elsa at Akershus? No, they used to meet near Akershus, but they are no longer there. Chef Mickey’s is at The Contemporary which is outside of Magic Kingdom. WE have an 8:05 reservation in November and plan to do the same thing. I was googling to see if it would work, and it looks like it does. Thanks! Do you think there is any chance that they would rename Cinderella castle a frozen name? And do you feel that they are over doing it just a bit much with all the frozen things? I know that all the little kids love it and everything it is just sort of sad. We have A&E fast pass for anyone that might need it And I’ll drop it. We got one for Monday along with a BBB Apoinment that morning. Just let me know. I’m looking for dinner at Cinderella royal table that night as well. What day is it for? and time? Thanks!!! I had a quick question since we’re planning our first trip. For character meetings like this one, do I need to fastpass+ for the entire family for Anna and Elsa? Or just the kids? We are going in the fall of 2015 with my 4yr daughter. If I don’t get a FP I am not to worried. She will never know the difference. She can’t be upset about something she doesn’t know about. When making FP+ reservations for character meet & greets, do the adults need to have a reservation or just the children who will be interacting with the characters? Everyone needs a FP+ if they intend to go inside the building. Even if you are just going to take a picture and don’t want to meet the character you are still required to have a FP+ reservation. What does FP+ for Anna and Elsa Actually get? Shorter wait time? By how much? Should you show up exactly at the start of your FP+ time? We have BBB appt. 1 1/2 hrs before our Anna and Elsa FP+. Now that I’ve read on your blog how far behind BBB can get later in the day, I’m afraid we’ll be late to Anna and Elsa FP+. THEN we have dinner at BOG exactly 1 hr after our the start time for our Anna and Elsa FP+. Summary 4 pm BBB, 5.30-6.30 FP+ for Anna and Elsa, 6.30 BOG Is this timing waaay to close??? We have reservations for just hair and make up at the BB Boutique and should be done before rope drop. (Sept 2015) I am wondering if we should go standby for the princesses or if we should still try to get FP+ reservations. I don’t know how they merge the line that they walk up and those who line up at Fairytale Hall. Regarding the new ride and meet & greet…what is considered early 2016? How soon would FP open for them? I’m tentatively planning a trip in mid-February 2016 so that we would be there on my daughter’s 5th birthday. Elsa and Anna are a must for us! The DIBB site WORKED! I have to thank you because you helped make our day this morning. All the Meet Anna and Elsa FastPasses were taken for our trip coming up. I checked DIBB when I woke up, and our day at Magic Kingdom went from red to green! I jumped on the Disney site and sure enough: 6 FastPasses were available! We seriously were dancing around the room. All the time we will save not waiting in line! Thank you for that great tip! How do I sign up for the DIBB? Thanks! My fast pass window has not opened up yet. Let’s say I don’t get a fast pass. Are E&A in the princess hall until park close? Could I stand in line 1/2 before park close to meet them. I know we might still have a long wait but we’d waste less touring time. We aren’t going JUST for A&E, but my 8 year old definitely does want to meet them. I’m really hoping for a FP! We aren’t eligible until March for our FP selections but I’ve been worried about it since we started planning our trip! We are eating in Cinderella’s castle one evening. Don’t know what to expect?? Any chance we will see Anna and Elsa at dinner? Just visited WDW Dec 1st thru 6th and seeing A&E was most important to my five year old. So MK opened at 0800 one morning so Extra Magic Hours were at 0700. So we got up at 0530 left the resort and drove to MK at 0630 in line once park opened rushed to Princess Fairytale Hall at 0700 and saw the princesses in STANDBY in 30 minutes. Seems like a lot but my daughter’s joy was priceless. BONUS: after that all the busy rides had wait times of 5-15 minutes with SDMT having a wait of only 20 minutes at 0745! Sooo worth it! I wonder how much more burned out from Frozen people will be by the time the new Epcot attraction opens? I’m already seeing it on the faces of various people. Get the FP+! You could always cancel it later, but you will kick yourself when you get there and she decides she wants to do it! Shannon, I wonder if telling people to log on to get FP+ at midnight Eastern US time might be helpful.at least in our case, we signed on at 10:57 central time and hit refresh until 11 PM CT and we got all of our fast passes and we’re done by 11:10 PM. I have no idea if that works in all cases, but it certainly would be worth a try. I took your advice and jumped on the Fast Pass selections right at midnight in high hopes to get one for the Elsa and Anna meet and greet. Right at midnight when I could finally select our party, it was already sold out. My computer didn’t even say 12:01am yet. I’m so disappointed. I did get FP for the show at Hollywood Studios. Our entire trip is because of Frozen – I have twin daughters who are 4 and literally think they are Elsa and Anna! Now I’m thinking about pushing the trip to 2016 for the new ride and I’m sure by then they will have incorporated them into character dining experiences. We leave next Wednesday for 10 days, and we are very excited. I am SO glad my daughter (10) has no interest in meeting the Princesses, especially the Frozen girls (she has never been a Princess fan) as I hear all of these horror stories. A two+ hour wait to get a picture might actually cause my head to explode, LOL. Thanks, Shannon for this article! I was wondering if there was going to be a meet & greet aspect along with the new redone attraction in EPCOT. Now that I know there will be I was wondering if you could clarify what year it’s going to be finished? You have listed 2016, but I thought it was next year in 2015? I really hope it’s 2015 as I’m planning a trip for December of that year. Thanks again! Nope, it’s always been slated for early 2016. I did mention the new meet-and-greet in the Epcot section of this post as it’s being built along with the ride.